Students walk to school Oct. 5, 2016 during International Walk to School Day. KASD photo. KAUKAUNA – The incident a week ago where a student was injured on her way to school has increased the urgency of the Kaukauna School District’s safety initiatives. Part of that process is a safety survey that parents can complete online regarding students who walk or bike to school. The deadline is April 21, 2017. 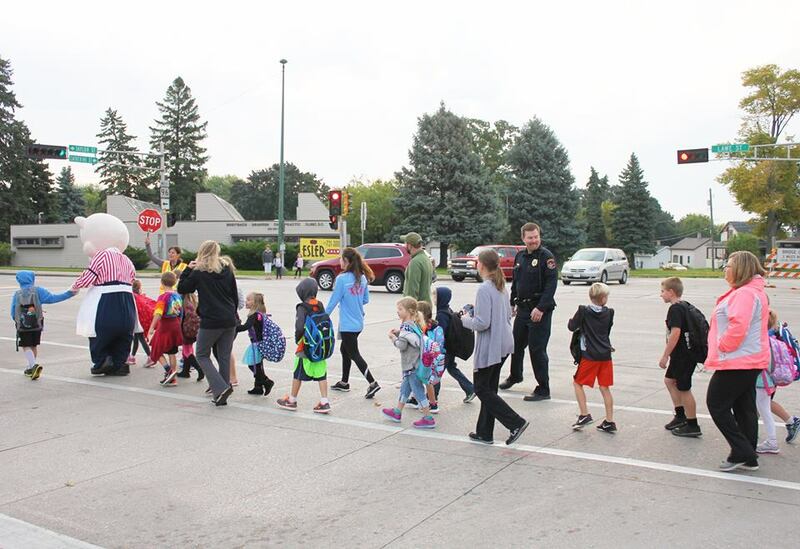 The district is working with the East Central Wisconsin Regional Safe Routes to School Program, as well as the City of Kaukauna and the Kaukauna police and fire department to increase the safety of students walking or bicycling to school. In the most recent incident, a student who was riding her bike to Park Community Charter School the morning of April 10, 2017, was injured when she was struck and hit by a car. “While the timing of the survey release coincided with Monday’s accident near Park Community Charter School, this survey is a step in a process that has been ongoing since before the start of this school year,” School District Communications Coordinator Jill Aykens said in an email. The district is asking all parents with students in 4K-Grade 12 to fill out the survey by Friday, April 21, 2017. Justin Johnson, a 12-year-old seventh grader at River View Middle School, died Tuesday, Sept. 6, 2016 after being struck by a school bus in downtown Kaukauna. He had been crossing with the walk light on, according to the results of an investigation. Johnson was walking home with other kids after the first day back at school when he was struck. The accident happened at the intersection of Crooks Avenue and Second Street. The survey asks how many of a family’s children bikes or walks to school and what factors are involved in the decision, such as convenience, distance to school, traffic, crossing guards and other factors. Administered by the Wisconsin Department of Transportation, the East Central Wisconsin Regional Planning Commission was awarded a Safe Routes to School Grant in 2010 to provide local communities and schools the resources and the knowledge to increase the number of students walking and/or biking to school.